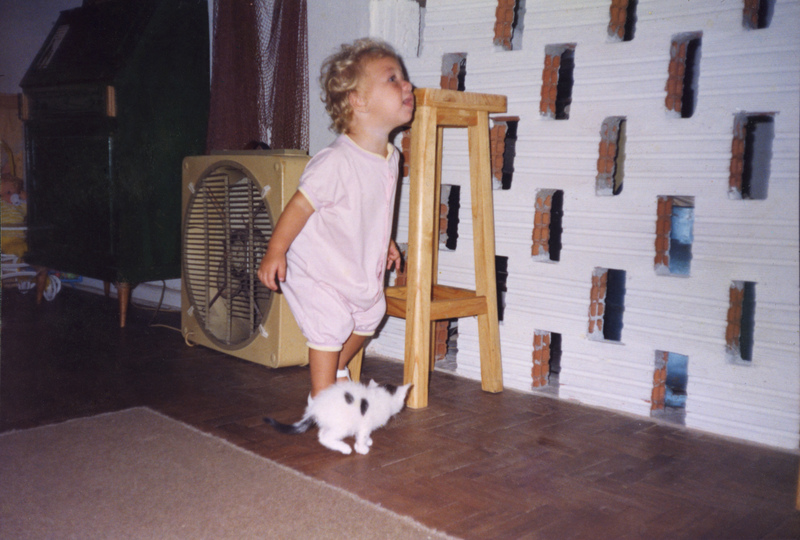 Baby me and my first cat, Bolinha (diminutive for ball) / Eu bebê e meu primeiro gato, Bolinha. Fear and hate in general are feelings that arise from the unknown, if I dont grasp it, I fear it. There is also the possibility of fear to be the result of a bad experience in the past, a trauma. As a kid I never liked dogs, my mother says that one day, a huge dog of a friend, jumped on me and knocked down me when I was about 3 year olds. I just got to know this story years later, from complaining so much in the presence of any dog, she told me that. I was always afraid, and avoided them, used it cross the street so I wouldnt be close, I never found any of them cute. If we were going to a house that I knew had a dog, I would suffer from anxiety in advance to imagine having to face a beast of those in the same room as me, or simply just at the entrance of the house. From an early age I had contact with cats at home, in my grandmother´s house, on the street I always made sure to get close to them, encouraged by my mother, who throughout her life have probably had around 9 cats. I admired their beauty and behavior, and over time I began to further identify myself with them. There was a phase where I raised the flag to say they were the best, and could not bear dogs because I thought they were silly. This was nothing other than me trying to self affirm to an animal I have total involvement, trying to reduce the other animal that made me insecure. When I was round 10 years old riding my bike on the my gramma´s street, a neighbor who had rottweilers came out for littering, and guess what? The dog ran out to the street! Today I’m not even sure if it came after myself, but I despaired, left my bike on the pathway, went in and closed the gate really fast. 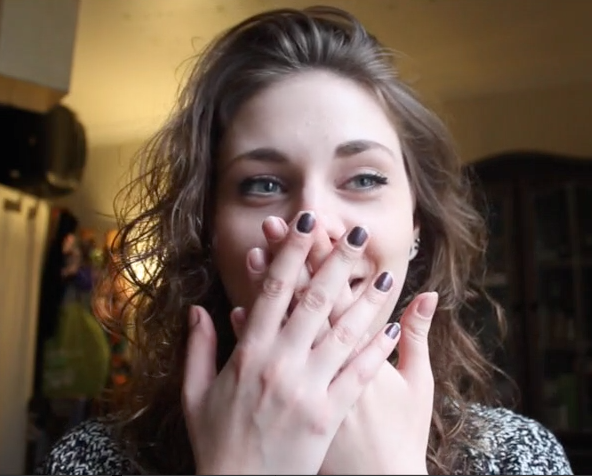 It was scary, I thought I was going to die and this reactivated that trauma. Over time I could not get away from certain situations involving dogs, a friend that I frequented the house like mine, had a dog called Hanna and it took me a while to get used to her. I had in mind: “show no fear, but keep away, try to greet to see she leaves me alone”. I even had to deal with a rottweiler a schoolmate had when we used one or two lectures off to go to her house. I remember to explain in advance about my relationship with the species and my colleague assured me that the dog was quite calm. Arriving at her house, who received us? Fila was her name, huge, and really very calm, just came to see who were coming, let her smell me as I repeated with my heart racing, my internal mantra: “show no fear, but keep away, try to greet to see if she leaves me alone”. It was by having to go through such situations, rather than avoiding them, I began to notice more canine behaviours, find out that they bark but do not bite and do not attack for anything, understand gestures, noises, all this that for me It was scary and I could never find out whether they were good or bad. Medo e ódio em geral são sentimentos que surgem do desconhecido, se eu não domino, eu temo. Também existe a possibilidade do medo ser resultado de uma expêriencia ruim no passado, um trauma. Desde criança eu nunca gostei de cachorros, minha mãe diz que um dia, um cachorro enorme de uma amiga, pulou em mim e me derrubou quando eu tinha uns 3 aninhos. Eu só soube dessa estória muito tempo depois, de tanto reclamar na presença de qualquer cachorro, ela me contou. Today is World Mental Health Day, so I decided to contribute to the Awareness week by posting a project I developed at university in 2014. It was the first week of Year 2, Semester 2 and we had to get into groups depending on the subjects we would work on to create a photography artefact to be exhibited in a gallery. I wanted to work on something related to the fading of time, passage or memory somehow. That was when some students approached with their initial ideas of working with family and loss. 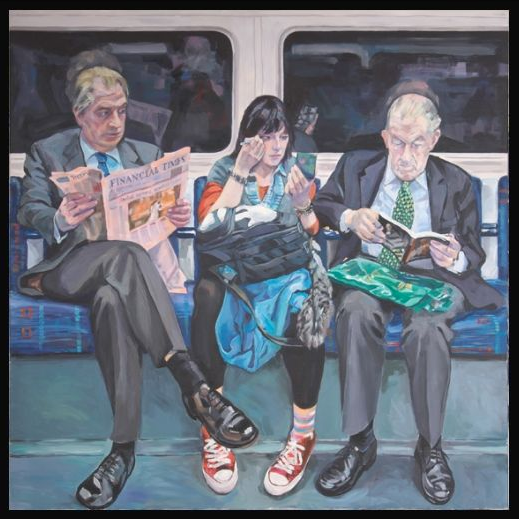 At first I felt I wouldn’t fit into the group, and that I didn’t wanted to work with such tense subject, but then realised it could be related to the feeling I had about time, more or less related to family, generations and loss that are always present in a way in my life. Analysing this I noticed that I could work on something I have been thinking about a lot in that past months, which is the fact that I am melancholic and through the years I felt it in different ways and have to deal with a contrast of feeling it brings me. For these past months I read a lot on this state of mind/being, before deciding working on it for a photography project, which helped me to understand how I feel it, making me see it in a good inspirational way, as part of the person I am. There is no reason to feel melancholic, but once I feel it, it is like being drag back to things in the past that can never come back, or simply the fact that in the present I am having either good or bad time, and can´t be with people I used to, loved ones that are far away and neither I can be part of their life totally and neither they can be present on mine. Due to leaving my country in the age when you get your best friends, moving around many times and not being able visit them and family members also, always have this melancholic feeling. This made the exhibition called “Presence of Absence”. I decided to read more about this to be able to develop my project, looking at Ancient Greek and Roman Mythologies which I have always been interested on and that have a peculiar view on this subject. Mourning and Melancholia by Sigmund Freud, which was complex to read but helped me a lot to see specially the differences and similarities between these two feelings that our theme involves. I noticed that like me other people see it in good and bad way, sometimes choosing only one side of it, but in my case I deal with both and think both are important to live so that I develop myself as a person and end up having something constructive from it. 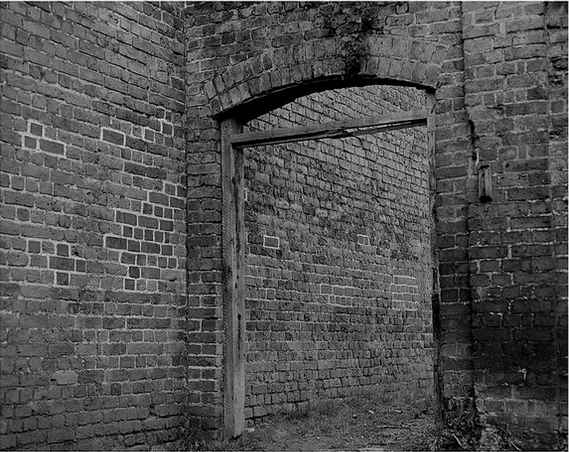 The set of photographs is portraying in an abstract way the state of mind of Melancholia with similarities and differences to the loss/mourning feeling. The fear of loss and constant knowledge of the existing or future absence from someone’s life is present on my life and having to deal with it inside is what inspired to produce the work. Approaching the different ways this feeling gets personally manifested, I interpreted them making emotion visual by using distinctive medium and tones: one brutal & extremist (using medium format camera with B&W film) and other inspirational & poetic (photographing digitally and in colour). Theories before the Renaissance, linked Saturn and melancholia. The Romans identified Saturn with the Greek Cronus, whose myths were adapted for Latin literature and Roman art. In particular, Cronus’s role in the genealogy of the Greek gods was transferred to Saturn. Saturnalia festival in the Roman calendar led to his association with concepts of time, especially the temporal transition of the New Year. In the Greek tradition, Cronus was often conflated with Chronus, “Time,” and his devouring of his children taken as an allegory for the passing of generations. The sickle or scythe of Father Time is a remnant of the agricultural implement of Cronus/Saturn, and his aged appearance represents the waning of the old year with the birth of the new. Saturn takes rulership of the signs that govern midwinter, like Capricorn. Therefore governs the melancholic temperament in these individuals. The colours of Saturn are those that want for the vibrancy of additional hues, being typically dark and black (Saturn’s contact can add an element of darkness to other colours), white and pale, or a grey, ashy colour. They do not display their emotions easily, but their emotions, like their imaginations, can be profound. Such individuals are observably deep, sincere, and generally gather respect. Aristotle explained brilliance of mind and the exceptionality of great men in literature, politics, philosophy and the arts in terms of melancholy, that all those who have become eminent in philosophy or politics or poetry or the arts are clearly melancholics. Hoje é o Dia Mundial da Saúde Mental, então eu decidi contribuir para a semana de consciência postando um projeto que eu desenvolvi na faculdade em 2014. Foi a primeira semana do segundo ano, no segundo semestre e tivemos que entrar em grupos, dependendo dos assuntos que iriámos trabalhar e criar um artefato fotográfico para ser exposto em uma galeria. Eu queria trabalhar em algo relacionado com o passar do tempo, mudanças ou com memória de alguma forma. Foi quando alguns alunos se aproximaram com as suas idéias iniciais de trabalhar com os temas, família e perda/luto. No começo eu senti que eu não iria me encaixar no grupo, e que eu não queria trabalhar com um assunto tão tenso, mas depois percebi que esses temas poderiam estar relacionado com o tempo, mais ou menos relacionadas à família, gerações e perda que estão sempre de uma forma na minha vida. This past week it was announced a change to the way all large shops and supermarkets in UK provide plastic bags. Now it is a general government rule, and not a matter of preference up to the market chains, like it was before. Prior to this new rule, Lidl would only provide a multi-use plastic bag at a cost, similar Spar in other European countries, what charge for single-use plastic bags. While a few already followed this strict attitude towards their customers, other chains like Tesco, Sainsbury’s, etc, would keep both options of providing free single use and a charge for multi-use plastic bags for the most ecologically conscious. What I would like to point out is something I will do with a series of posts, to compare these rules, behaviours and manners that have different reactions from populations of UK and Brazil. In Brazil, a couple of years ago there was an attempt to introduce some consciousness about ecology by removing single-use plastic bags from customer’s reach. This caused rebellion, people complained that the cost of plastic bags were included in the tax that is payed combined with the cost of the products in store. From London I observed the news, and for me it seemed more a commodity matter, rather than suspicion of being charged twice. There was such a negative feedback from the population that the rule was cancelled and single-use plastic bags are again being provided for free. This year the rule is trying to get back in practice in Sao Paulo, providing “green bags” at a cost, made of bioplastic the initiative attempts to stimulate people to rethink the way they consume these bags, inspired by (guess what? ), “…international standards and can be applied elsewhere in the country.”, stated by Marina Estarque from Carta Capital. “I think it’s bad to have to pay, I will bring a house,” says Josmy. 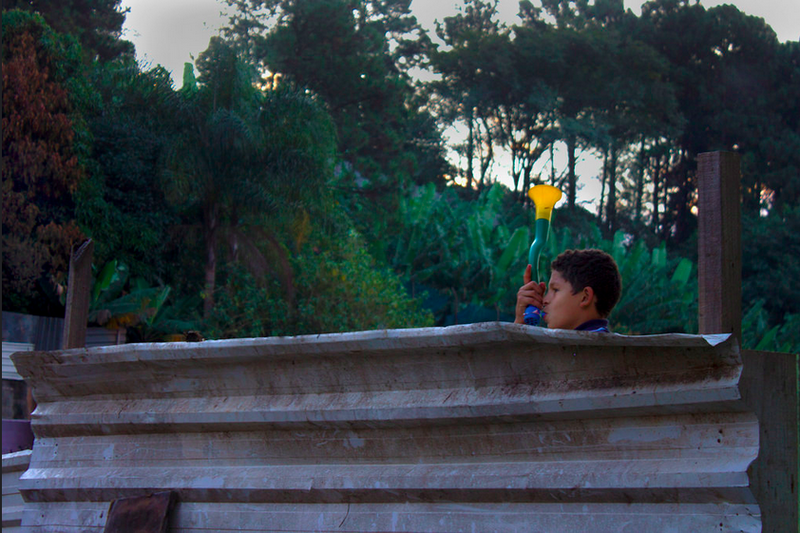 “When people have easy access, they end up accumulating or playing outside”, said Camila Oliveira, 21. Well, this is what is called “change” and this takes time to get adapted to people’s everyday life. Hopefully here in UK and in Sao Paulo, people get their head around it, preparing for a more sustainable future! Particularly I found this new rule amasing, I am ecologically aware and end up storing all plastic bags at home so I can reuse most of them. Unfortunately I have been a little lazy and could have invested in multi-use/more resistant plastic bags or carrier bags made of other materials to take my shopping home. This laziness to take such attitude has been fed by the commodity of having free bags available at the supermarket, what can be a little more practical as you dont have to think in advance and remember to bring yours from home. I know I will forget at times and complain others, but this rule is a favour really. A short video for consumers and others explaining the 5p charge for single-use plastic carrier bags. 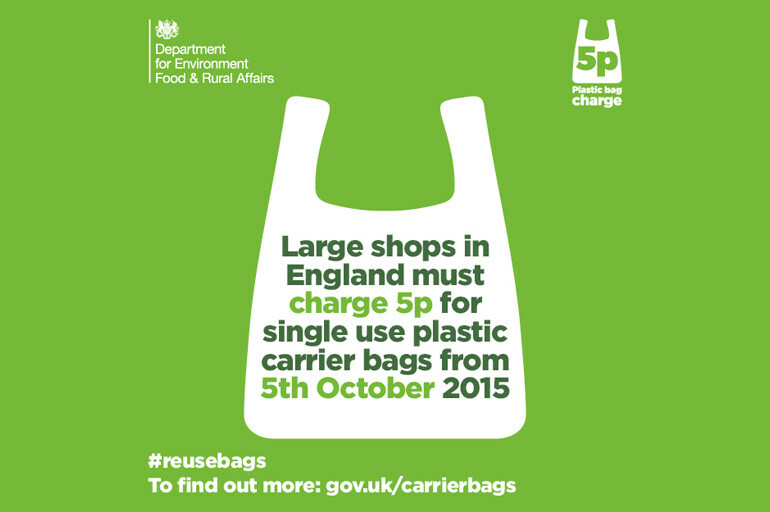 The charge is being introduced in England from 5 October 2015. Na semana passada, foi anunciada uma alteração na forma como todas as grandes lojas e supermercados no Reino Unido fornecem sacolas plásticas. Agora é uma regra do governo geral, e não uma questão de preferência das cadeias de supermercado, como era antes. Anteriormente à essa nova regra, o mercado Lidl só fornecia um tipo de sacola de plástico multi-uso, por um valor, similarmente o mercado Spar em outros países europeus, cobra pelo uso de sacolas plásticas descartáveis. Enquanto alguns já seguiam essa atitude rigorosa perante aos seus clientes, outras empresas como Tesco, Sainsbury´s, etc, preferiam manter as duas opções fornecendo sacolas plásticas descartáveis de graça e uma taxa por sacolas de plástico de multi-uso para os mais ecologicamente conscientes. If you grabbed a copy of the Evening Standard on the 30th July 2015, you would find a copy of an uncredited image of mine! The article featured the Wembley to Soweto’s exhibition, at The Hospital Club Gallery in Covent Garden on 20th to 24th August 2015. Today I got really excited to have my first photograph published in a newspaper with great visibility like Evening Standard. 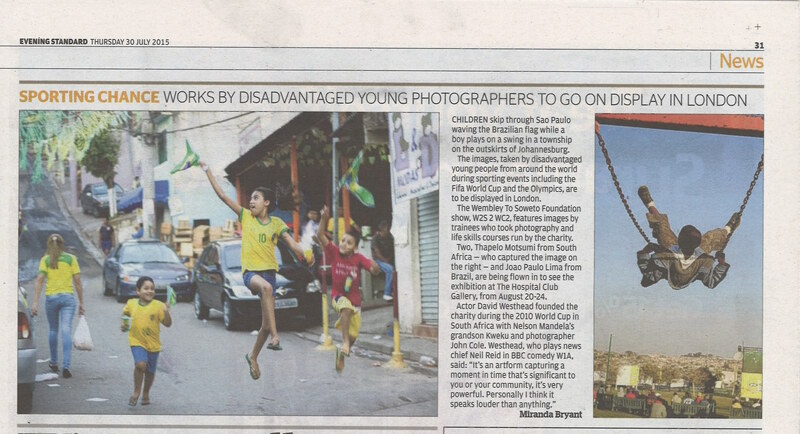 In News, the article written by Miranda Bryant, it has been featured the upcoming exhibition at The Hospital Club, of the photographs taken during the Wembley to Soweto project in Brazil World Cup 2014, in which I participated as a photography mentor together with John Cole and David Westhead. These photographs were also exhibited in Sao Paulo’s British Embassy and at the Community Centre in the Colombo Favela where we were based. I can not stress how much I felt disappointed with the fact that my photo, on the left side of the text, did not get credited, neither at least I got a mention on the text as Thapelo did for his image on the right hand side. For an emerging photographer like me, it is difficult to get the chance of having a photograph published like this, and my chance of visibility and prestige for the work I produced with Wembley to Soweto, has been taken from me with the simple fact of ignoring the authorship of the image, which would have been easily mentioned here. For some, photographs are just illustrations next to an article. For photographers, they are the result of our dedication to our careers, just like I believe articles and publications are for editors and journalists. I expect a rapid response on this issue, a respectful and satisfying way of compensation towards me. I’m really sorry you were disappointed that we didn’t mention your name. The images were provided by the people who are doing PR for the exhibition and there was no suggestion that the inclusion of credits was obligatory. I’m afraid it isn’t something we do as a matter of course for every picture we publish. Our picture editor has said he would be prepared in the circumstances to pay you a fee to mitigate your disappointment. It is quite upsetting really, having to chase for your own rights. Enough is said, but maybe not enough has been done to prevent it. Se você pegou uma cópia do Evening Standard no dia 30 de julho de 2015, você teria encontrado uma cópia com uma foto sem créditos a mim! O artigo destacou a exposição Wembley to Soweto, no Hospital Clube Gallery em Londres, Covent Garden em 20-24 agosto de 2015.